Motherwell travel to Livingston on Saturday in search of a fourth league win from five attempts. The prospect of reducing the gap with our opponents to two points provides a huge incentive for Stephen Robinson’s team. If current form persists an away win seems likely. 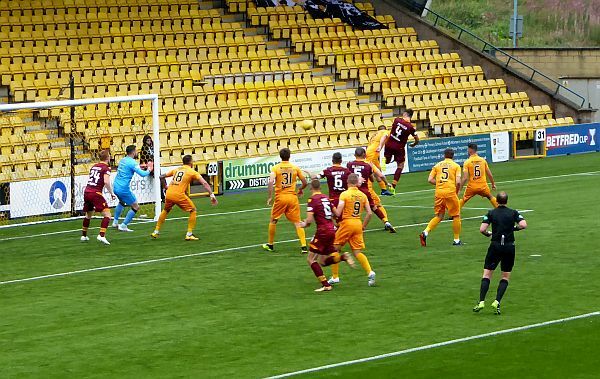 Livingston have taken only one point from their last four outings while Motherwell have been delighted with nine. However, swings of momentum are not unusual in this division and a good performance will be needed if the spoils are to come to Lanarkshire. The news that Chris Cadden has a knee injury that will force a four month lay-off comes as a bad blow. The speedy midfielder seemed to be regaining the form that gained much attention and he will be missed. We wish him a speedy recovery. We will also have to cope without Peter Hartley and Carl McHugh as they complete suspensions but the opportunity to play in the first eleven has been embraced by Christian Mlumbu. The 22 year old impressed with a commanding showing last week as we kept a clean sheet in the win over Aberdeen and he will partner Tom Aldred in central defence. Danny Johnson’s man of the match award last week suggests he will start alongside Curtis Main in attack. Our hosts will be without their regular striker, Dolly Menga, and that will do nothing to end their goal scoring drought that now stretches to four games. We had a League Cup win in the Tony Macaroni stadium in August when Danny Johnson settled the tie. He may make the difference again on Saturday – 2-0 to the Mighty ‘Well.